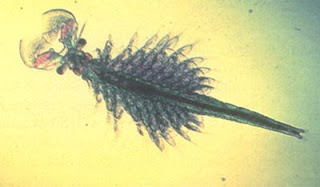 Nauplii of the brine shrimp artemia constitute the most widely used food item. Over 2000 metric tons of dry artemia cysts are marketed worldwide for on-site hatching into 0.4 mm nauplii. Those cysts are available year-round in large quantities along the shorelines of hypersaline lakes, coastal lagoons and solar saltworks scattered over the five continents. After harvesting and processing, cysts are made available in cans as storable ‘on demand’ live feed. Upon some 24-h incubation in seawater, these cysts release free-swimming nauplii that can directly be fed as a nutritious live food source to the larvae of a variety of marine as well as freshwater organisms. Its use as a food for the culture of larval organisms began in the 1930’s. During the 1940’s, most commercially available brine shrimp cysts represented collections from natural saline lakes and coastal saltworks. 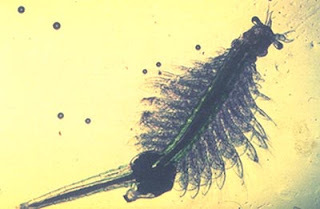 Early pioneers exploited in 1951 the cyst production of Artemia at the Great Salt Lake in Utah, USA.